You want to talk about an institution, then let's talk about Tommy's in Cleveland Heights. A friend who grew up just around the corner, aka a local, recommended Tommy's and it did not disappoint. Tommy's serves up anything vegetarian you can possibly think of, from spinach pie to a tofu salad sandwich. No need to worry my carnivorous adventure seekers; Tommy's also offers meaty options like a TLT (turkey, lettuce and tomato) and a good old fashioned bacon cheeseburger. I was feeling especially adventurous and decided to try the falafel. I had never had falafel before so I wasn't exactly sure what to expect. I do know one thing now after trying the falafel at Tommy's: they are the standard I will hold all future falafel adventures to. A falafel is a deep fried ball or patty made from ground beans such as chickpeas or fava beans. A good falafel is golden and crunchy on the outside while being soft on the inside. You’ll find falafel as a staple in most Middle Eastern & Mediterranean cuisines. A Tommy’s falafel is served with sprouts, sliced tomatoes, and chopped green bell peppers stuffed in a pita. You can order additional toppings to make it your own. I also got mushrooms, cheese and a sesame sauce. It was so deliciously tasty that I almost forgot I was eating vegetables. 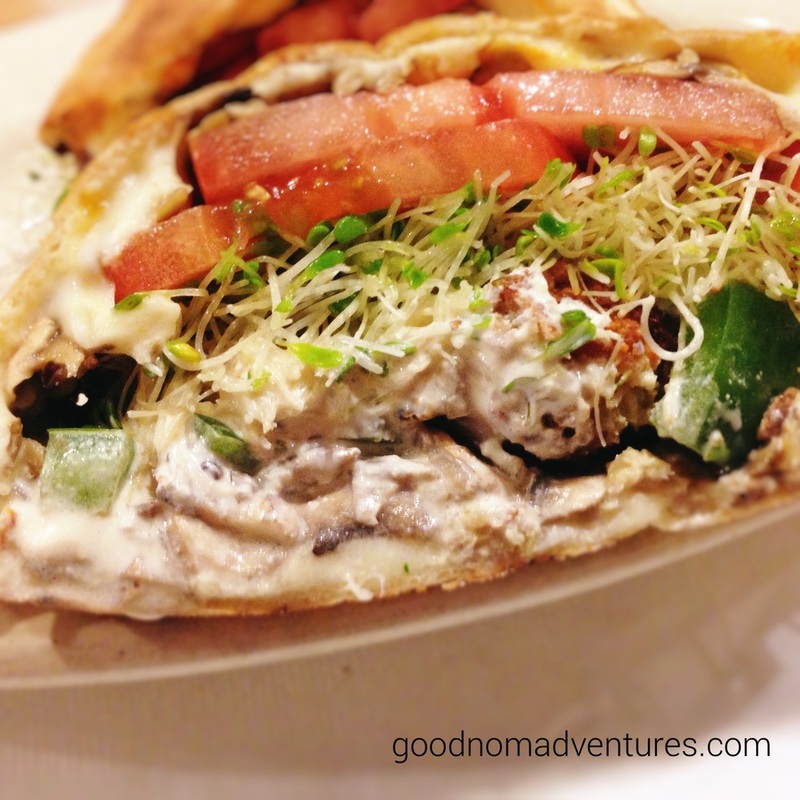 The cheese melted throughout the pita which was stuffed with a perfectly crunchy and moist falafel. The veggies added more crunch to every bite and I could enjoy it all guilt free. As I looked around the restaurant I noticed that everyone had these milkshakes so of course I had to have one myself. They have the most extensive milkshake menu I have ever seen. You can pick flavors like the classic vanilla and chocolate or the not-so-traditional lemon sorbet or cookies and cream. They also offer seasonal flavors so you always have different options to try. I opted for the black cherry and it was awesome. It was flavorful without being too sweet. I recommend putting Tommy's on your bucket list. It's great food, especially if you're vegetarian, and awesome milkshakes.